Mpls Southwest 4-0, Mpls Alpine 3-1, Mound/Westonka 2-2, Wayzata 1-3, Lake Crystal Valley 0-4. Wayzata 4-0, Mound/Westonka 3-1, Mpls Southwest 2-2, Mpls Alpine 1-3, Lake Crystal Valley 0-4. Jefferson 799, Hastings 768, Mpls SW 753, Mpls Alpine 682, Orono 675, Eagan/Eastview 666, BSM 661, Burnsville 593, Apple Valley/Rosemount 589, AHA 587, Simley 537, CDH 487, SPA 397, Richfield 337, Rochester John Marshall 317, Northfield 229 (tie), Rochester Century 229 (tie), Rochester Mayo 162. Jack Lindsay (Burnsville) 57.29, Luke Doolittle (Eagan/Eastview), Odin Mueller (Mpls Alpine). Mpls SW 764, Hastings 744, Mpls Alpine 687, Eagan/Eastview 670, BSM 637, SPA 631, Orono 619, AHA 592, Apple Valley/Rosemount 581, Burnsville 557, Northfield 537, Simley 469, Jefferson 390, CDH 385, Rochester John Marshall 373, Rochester Mayo 267, Rochester Century 216, Great River School 197, Richfield 143. Skye Sonnega (Northfield) 1:03.42, Ali Hofstad (Eagan/Eastview), Morgan Gasser (Jefferson). Registration is Open for the 2016-17 Minneapolis Alpine Ski Team! Register to be a member of the 2016-17 Minneapolis Alpine Ski Team. Registration is a two-step process. The first step is to register on-line with MAST. The second step is to register with your high school athletic director. Please read and follow ALL instructions carefully. If you are a returning MAST athlete, please review all the information submitted in past years to insure continued accuracy (phone numbers, insurance information, school, etc.). ​Here is a link to the MAST Registration Process, 2016-17. Please set aside Saturday, Nov. 19 for a daylong retreat with your teammates and coaches. Depart Washburn HS at 8AM. Return TO Washburn HS at 5:00PM. We strongly encourage all MAST athletes to attend. Be sure to RSVP--Accept or Decline the invitation to attend the retreat. Cost: $10 suggested donation to cover transportation. Registration: All MAST Athletes need to accept or decline this invitation to RETREAT with your coaches and teammates. ​We ask every athlete to take an ImPACT Concussion Baseline Test prior to the start of the season. Testing will take place Thursday, October 27 at both Southwest and Washburn. We will try to schedule a second testing date in the next week or two, but if you can take the test tomorrow then you will have one less thing to do before the season begins. All new athletes to MAST need to take the test (unless you took it for a different sport this fall). All returning 8th graders need to take the test again. And all returning athletes who took the test in 2014 or earlier need to re-take the test. Southwest High School, Room E104: 4:30 Start. Arrive between 4:15 and 4:25. Kelsey Gleich will be administering the computerized test. Washburn High School, Cafeteria: 3:45 and 4:45 Starts. Arrive between 3:30 and 3:40 for the 3:45 start. Arrive between 4:30 and 4:40 for the 4:45 start. Enter school through Door #5 on the 49th street side of the school. Reggie Ronning will be administering the test. $40 for lift ticket and transportation. $17 if you possess a Welch Season Pass. Skis, boots, poles, helmet, goggles, ski wear, extra ski socks, shin guards. Dinner or money to purchase dinner at the ski area. Step ONE: Register online HERE. Make checks payable to Mpls Alpine or MAST. Our year-end banquet celebrating another successful year of MAST skiing will be held on Sunday, March 23rd, 2014 from 5:00 – 8:00 pm at St. Stephen Lutheran Church, 8400 France Avenue South, Bloomington, MN. Join us our Eighth Annual Giants Ridge Camp from Thursday, January 23rd to Sunday, January 26th, 2014. Giants Ridge offers challenging terrain and sixty gate course sets. Lodging at the Sports Dorm on the hill. 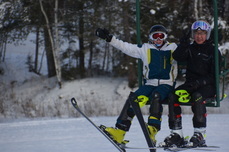 Once again, MAST will engage in a dual meet with Virginia Area Alpine Ski Team on Saturday. Another chance to get Team Apparel: MAST will be placing a second Team Apparel order. If you missed out on placing an order the first time around, you can still do so now. Deadline is Tonight (Tuesday). Attached is apparel information and an order form. Dryland has started and will continue Monday through Friday until Hyland opens for skiing. When: Monday-Friday from 4:30-6PM (No dryland training Nov. 27-29). To register for MAST 2013-14 season please complete this online form. All of our communications are via email so please be accurate. Any questions contact Mark Conway at 612-275-8392.